The form control object listens to any change in the input control values, and they are immediately reflected in the object's state. Since the component has direct access to the data model structure, all changes can be synchronized between the data model, the form control object, and the input control values. Practically speaking, if we are building a form for updating the user profile, the data model is the user object retrieved from the server. By convention, this is often stored inside the component's user property (this.user). The form control object or the form model will be bound to the template's actual form control elements. Both these models should have similar structures, even if they are not identical. However, the input values shouldn't flow into the data model directly. The image describes how the user input from the template makes its way to the form model. Here is the directory structure for the src/ directory. I've removed some non-essential files to keep things simple. As you can see, a directory for the SignupForm component has been created automatically. That's where most of our code will go. I've also created a new User.ts for storing our User model. The CSS classes used in the HTML template are part of the Bootstrap library used for making things pretty. Since this is a not a design tutorial, I won't be talking much about the CSS aspects of the form unless necessary. 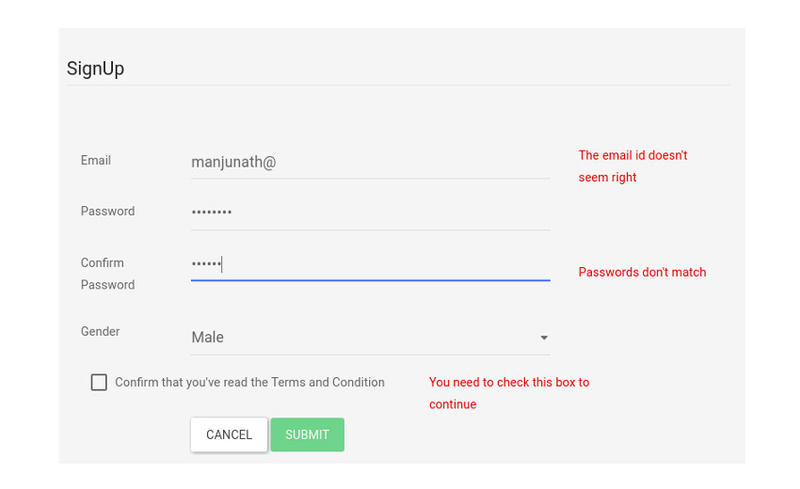 <option *ngFor = "let g of genderList"
We have a component, a model, and a form template at hand. What now? It's time to get our hands dirty and become acquainted with the APIs that you need to create reactive forms. This includes FormControl and FormGroup. While building forms with the reactive forms strategy, you won't come across the ngModel and ngForm directives. Instead, we use the underlying FormControl and FormGroup API. 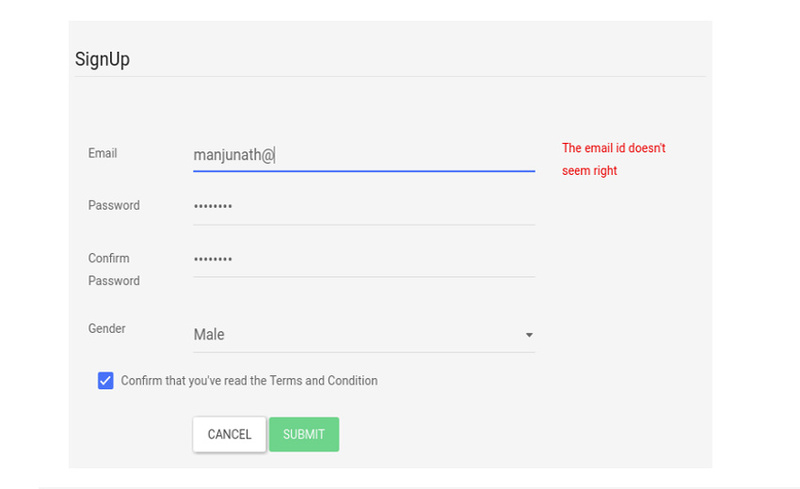 For our signup form, we have multiple input control fields (for email and password), a selector field, and a checkbox field. Rather than creating individual FormControl objects, wouldn't it make more sense to group all these FormControls under a single entity? This is beneficial because we can now track the value and the validity of all the sub-FormControl objects in one place. That's what FormGroup is for. So we will register a parent FormGroup with multiple child FormControls. <input type="text" formControlName = "email"
The JSON doesn't exactly match the structure of the user model that we created earlier. To get the hierarchical structure of the data model, we should use a nested FormGroup. Additionally, it's always a good idea to have related form elements under a single FormGroup. <input type="password" formControlName = "pwd"
<input type="password" formControlName = "confirmPwd"
We have a simple validation in place for the email input control. However, that's not sufficient. Here is the entire list of our requirements for the validation. That's it for the validation. However, the form model logic appears cluttered and repetitive. Let's clean that up first. Angular provides you with a syntax sugar for creating new instances of FormGroup and FormControl called FormBuilder. The FormBuilder API doesn't do anything special other than what we've covered here. The error doesn't explicitly say why it's invalid. To avoid this scenario, we've added the second condition. The error will be displayed only after the control has been visited. We use email.errors to check all possible validation errors and then display them back to the user in the form of custom messages. Now, follow the same procedure for the other form elements. Here is how I've coded the validation for the passwords and the terms input control. On form submit, the form model values should flow into the component's user property. Here is the final version of the application. 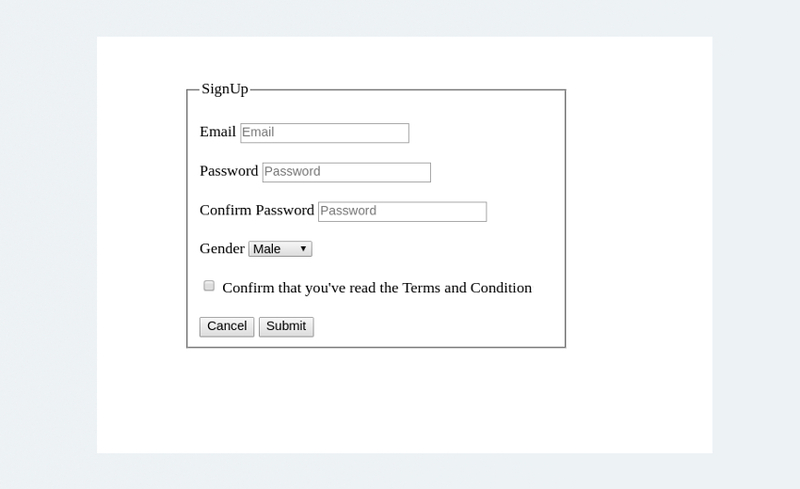 I've added a few Bootstrap classes to make the form pretty. 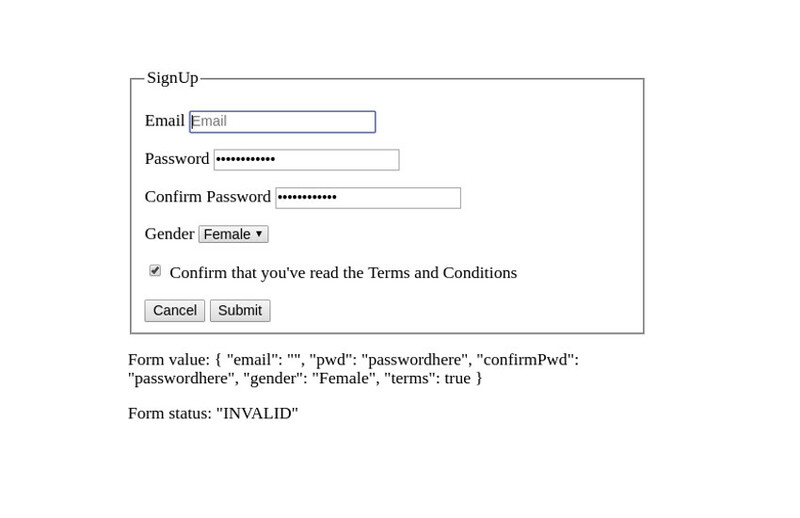 Unlike template-driven forms, Model-driven forms are easier to test. You don't have to resort to end-to-end testing libraries to test your form.